Winemaker Stephan Asseo began working in Paso Robles 10 years ago, after 15 years in France. Stephan Asseo, 47, came to Paso Robles in 1996 after making wine in his native France for 15 years. He was educated at the prestigious L'Ecole Oenologique de Mâcon, Burgundy, but his maverick streak and a desire to be innovative drew him to America. 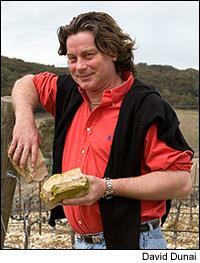 He launched L'Aventure in 1998, quickly establishing a reputation for his distinctive wines. Asseo's winery and vineyards are situated southwest of Paso Robles along the Pacific coast. Asseo has 56 acres of vines planted, including the Bordeaux grapes Cabernet Sauvignon and Petit Verdot, as well as Rhône grapes such as Syrah, Grenache, Mourvèdre and Roussanne. With an annual production of about 8,000 cases, Asseo makes excellent bottlings of Cabernet, Syrah and other varietals, but he finds his creative muse in unique blends like L'Aventure Côte à Côte and L'Aventure Optimus, which blur the lines between Bordeaux and the Rhône. He spoke with Wine Spectator on Sept. 25., during harvest. Wine Spectator: What has the growing season been like in 2006? Stephan Asseo: We've had a good season. The charm of Paso Robles is that we're really consistent with the weather. Because of the late picking date, it will be good for people with early varieties like Merlot and Chardonnay and for people like me who have late-maturing varieties like Petit Verdot and Mourvèdre. For people who did their job--managed their canopy and size of the crop--it will be a good year. WS: What do you expect from the 2006 wines? SA: They will be big but not as soft as in riper years. The tannins will be a little bit more European in style, and there will be lower alcohol levels and beautiful acidity. It's the kind of vintage I love the most. WS: How would you describe the terroir of your vineyard? SA: We're on the west side of Paso. There's kind of a geological break where Highway 101 passes. On the east side it's more loamy and sandy and situated at a lower elevation. On the west, we're higher and we have a lot of limestone. It's also cooler because the Templeton Gap brings in more of the ocean air. We have a lot of heat in the day but it's very cold at night. It's about a 45 to 50 degree difference in temperatures between night and day. That gives us good ripeness but we also have excellent acidity. WS: Anything new this year in the vineyard or winery? SA: This year I'm not using any more pumps to bring my juice to the tanks. I have two new conveyors and it will bring the fruit from the crusher to the tanks and really respect the berries. 2006 will also be the last year I use purchased fruit. I had a huge planting in 2004 and I now have 56 acres and I should get some fruit from those vines this year. In 2007, we will be 100 percent estate. WS: How is Paso Robles evolving? SA: Paso has gotten to be more recognized for Rhône varietals like Syrah and Mourvèdre, but you still see a great deal of Cabernet and other wines. People like to put labels on everything, particularly in Europe, although my approach is to create a blend of where Bordeaux meets the Rhône somewhere. In Paso, we are also in discussions to add seven or eight new subappellations to help distinguish the different terroirs in the region. I'm on the committee working on that. WS: What's the most exciting part about harvest for you? SA: To discover a new vintage every year, to see what will be the style of the wine. Even though it's very consistent in Paso, each vintage is different. WS: What's the scariest part about harvest? SA: Coming from Bordeaux, it's a piece of cake here. The weather and climate is like a dream. WS: How many harvests does this make for you? SA: Twenty-five. My first vintage was 1982 in Bordeaux, where I was a bottle washer, winemaker and slave. That was quite a vintage to get started on.